My first subscription box was at Quarterly. Quarterly gets really neat people and businesses to curate boxes of cool stuff every quarter. You buy in at a set rate (like $50 per box) and select your curator. Their box gets shipped to you and the items within are totally secret to you until they arrive. It’s a great concept. I jumped in when one of my favorite blogs, Unclutterer, was getting in on the action. It was exciting! Like Christmas! A box with secret items on my door step. And I liked the idea that these were selected by someone whose opinion I valued. The objects within would be worth my money. But soon the novelty wore off. I had $50 of items to help me organize my home, but they weren’t all things that I would be able to use. Or return. I canceled before my next box came. This is the problem with these subscription services. If you’re not familiar, they’re showing up hot and heavy on the internet lately. It’s a model very similar to Quarterly (described above), but with different products. There’s clothing, makeup, accessories, toys, pet treats, meals… all kinds of things. Selected for you by the experts at these companies and shipped to your home. The companies are nice enough. My experience with Stitch Fix and Dia & Co., two services that evaluate your style and send you five clothing items to try, were great from a customer service standpoint. (And each of them shipped me items made in America when I asked if they could!) The folks at Blue Apron were kind, too, when I canceled after my first week. The food wasn’t too shabby, either. But the clothes are never quite right. One or two items will be okay… or I’d have to settle on one article of clothing so not to lose my styling fee. (The fee is $20 you pay initially, which gets credited to the price of an item you keep.) Blue Apron had meals that weren’t really my style (or had nuts in them, but those are easy enough to omit or avoid) but I tried them anyway. Here’s my core issue. It’s something that can’t be erased by the fuzzy happy feeling that is “I’m getting a special package in the mail with a surprise inside!” Nor free shipping. Or coupon codes. These companies employ experts to handpick a package for me. But… they’re not experts on me. How could they be? I am one lady out of thousands. The allure of asking an expert to pick something especially for me is tempting but it’s a hard fantasy to deliver on. I’m sure there are people out there who are like, “Yes! Nailed it!” and end up with five new clothing items in their closet. I’m sure there are people who thrive in the structure a food delivery service gives them. Who are excited about new makeup. New toys. New stuff. But I can’t seem to find a groove. Usually it’s a hit and miss. I think I’ll keep to being my own personal shopper. I know what I like to wear and what I can eat. If I see something in a store, I can make a decision about it without having it shipped to my house first. There are a lot of wonderful things on the internet that I’ve enjoyed doing and buying – this just isn’t one of them. As for all the subscription services I’ve listed above, just remember – It’s not you. It’s me. Thanks for trying. Okay, this is a little PSA on alt text. What is alt text? If you use WordPress or design websites, you might have seen it as a field on your pictures. If you do web design, you might recall hearing about it. Alt text is “alternative text” and it has it’s roots in the earlier days of the web. This goes back to the days where we had dial up internet. Remember that? WEEEEE TRRRRK ACK ACK ACK. The modem dialed up and you waited for those sweet, sweet internets to come to you. Well, back in those days, images were slow loading. Alt text would explain what a photo was before it loaded. Or if it didn’t load… which was a common issue back then! Well, there’s a case to be made for why it’s still relevant on the web today and it has everything to do with accessibility. I found out about this issue from a good buddy of mine named Miller. Miller’s my age and completely blind. A childhood friend of my husband’s, they grew up together. Miller was sighted back then but lost his sight in his 20s. But Miller, god bless, is a nerd like us. So not being able to see the internet won’t keep him from using it. He uses a screen reader. JAWS is the most common. And it reads the internet to him. The reader goes SO FAST. Everythingseemsstrungtogetherwithnobreakjustthislongalmostbuzzingsoundthatisthetextbeingread. He says he can keep up. Sometimes I wonder if normally paced conversations are agony for him. For Miller and people like him, alt text is how they can know what a picture is supposed to be. It is read to them along with the text in the article/site/page/etc. In my gig as Online Editor at my school newspaper, we incorporated alt text day one. And while it is kind of a long process, I’m glad we do it. Take a look at the last photo you took on your phone. How would you describe it to someone who couldn’t see? How would you describe it to someone who might not know what colors are? It’s not only the right thing to do, there’s been laws and legislation passed that require compliance and reasonable accommodations be made in regards to those who need an accessible internet. Alt text is just the beginning. Some websites are designed in such a way that it is incredibly hard for screen readers to navigate. I will say, I can be better. I’m going to go back and make sure all my photos on this blog have alt text. It’s just a little thing that makes a huge difference for folks. It’s something maybe you can do, too, if you have control over your content. For those of you who might not know, there are several people who share my name and frequently use my email address when they go about their daily lives. It’s a minor annoyance but I figure it’s my duty in the universe to be a good ambassador of my name. With the holidays came a new flurry of activity and I thought everyone would appreciate knowing what they’re (I’m) up to. Almost joined the Nextdoor website when someone invited a Lauren for their neighborhood. It’s social media for your physical neighborhood so you can, I don’t know, arrange block parties and complain about that lady who feeds the stray cats. If I were evil that could have been fun. Invited to a track meet. Proof of insurance for a car. Someone loves shopping at Anthropologie!!! Signed up for French daily deal emails. For, well, France. Note to self: she is quickly turning into literary fodder. One Lauren had something (???) destroyed so I was greeted with an email titled, “CERTIFICATE OF DESTRUCTION” which might be the most metal thing I’ve ever been emailed. But then there’s the sad ones. Where some family member has made a mistake and emailed to let me know there’s a loss. There was one especially heartbreaking one right around Christmas. Grandma wanted everyone to know how she was doing that season, especially since her husband had died recently. She was sad but said she was surrounded by loved ones and it made a difference. I always let them know that I’m not their Lauren. But I also let them know that loss and grief is something shared by many people. We’ve all been touched by it in one way or another. I hope for their peace of mind. I never get a reply on those emails and it’s fine. I’m sure they have a lot to think about. But I hope their Laurens are reaching out and trying to help them. We need to take care of each other. It’s what humans do. Even if it means that we don’t get a spa day in Florida. Minions: New Voice of The Internet? Minions are everywhere. Surely, you’ve seen them. The adorable gibberish speaking monsters? creatures? aliens? things? from the Despicable Me movies. They’ve taken over movie theaters, McDonalds… and our HEARTS? To say that the public is obsessed about these little things is a huge understatement. But I must be honest. A couple weeks ago, I had no idea what they were. It wasn’t on my radar. What the what? I was confused. I knew they were from a movie but not much else. I investigated and asked friends about it. “They’re so cute!” “They’re hilarious.” “They’re the best!” “What do you mean you’ve never watched the movies? !” Some weekend media binging later, my husband and I were caught up. We even went and watched the new movie. They are cute and hilarious. But… how did they become the voice of the internet? I mean, I understand how they came to meme status. (Quick explaination of memes: when the internet makes something like an inside joke, often using pictures and text, it’s called a meme.) 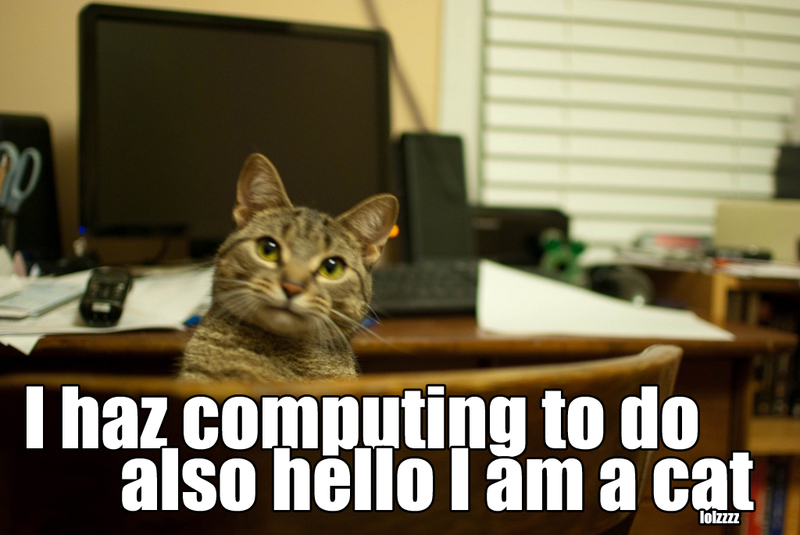 Minions share a lot with the fabled LOLcats of years ago. They’re cute and loveable in the eyes of most people. They have no color or creed or affiliation. They don’t speak any specific language, so you can project whatever you want on them. They are anything to everyone. 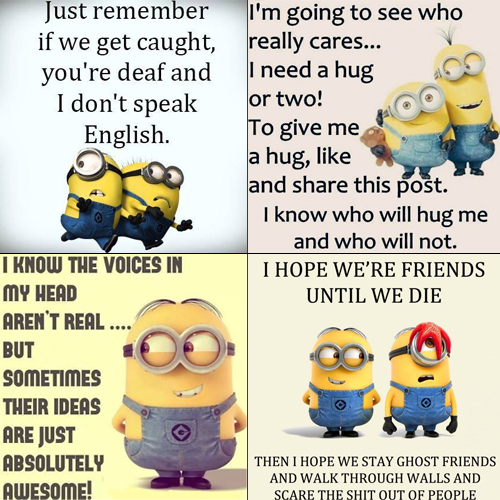 Except for some crucial differences… Minions are a symbol of friendship. They are friendly creatures. Cats are aloof loners who would gladly stab you to pieces and burn down your house, if they had the thumbs to do it. They “cannot haz friends”. 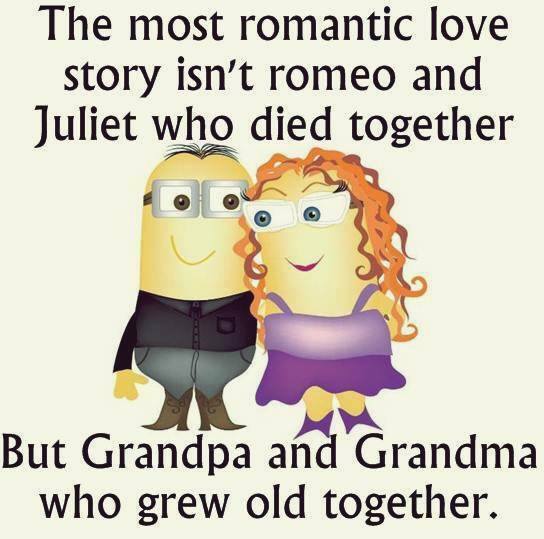 Minions do, which is why the memes above all have a friendly tone. (Except that one that one caters to the mischievous crowd. But you know the comments on that one were all, “OH TAG CHERYL! THIS IS SO YOU”.) 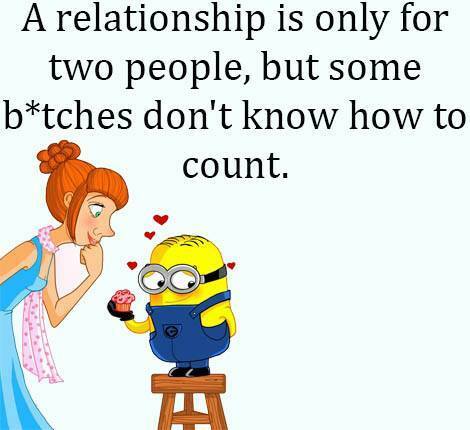 Minions are also LIKE people. Being humanesque makes it easy to project ourselves onto them. So the Minions are your mom’s LOLcats. 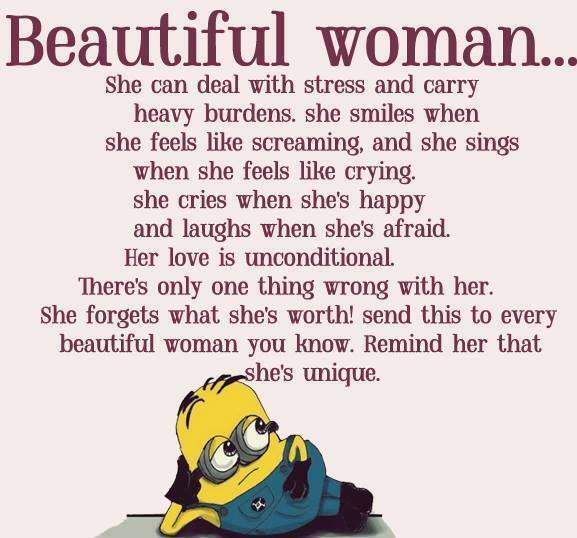 is the minion thinking about strong, beautiful women? why not put a picture of a STRONG, BEAUTIFUL WOMAN on it? I’ve seen a lot of things come and go the internet. Especially little image based fads. Is this one a keeper? Maybe for a certain demographic. I certainly don’t see it going stale anytime soon. But it is still pretty weird. Clickbait Headline: When they asked for help, the response had me IN TEARS!!! The newspaper headline lays out exactly what you’re getting into. The clickbait headline doesn’t tell you the who/what/where/when for a very specific reason: they want you to go to their website. They want to lure you in or trick you into going to their website, so they can show you ads and track your information and get you to like their Facebook page, etc. etc. That’s why it’s called ‘clickbait’. It’s a lazy, deceptive, and gross practice. You’re being misled. I understand that we’re in a time where people are giving away content basically for free and that ads are paying for the hardware and people that brought me the video of a puppy and baby who are ~best friends~. But often the website bringing you that information via a clickbait headline didn’t make it. They’re just dropping in someone else’s video or a link to a news story where someone else did the legwork. They just slapped it up on their site and passed it around Facebook with their crummy headline. I just think that there’s got to be a better way to go about this. Like producing quality content that will drive people to your site. Partnerships. Anything else. Just make it worth my while to click by telling me what I’m clicking on! There’s one I just saw on Facebook that had a headline like, “Her dog died due to a TRAGIC mistake. The killer could be at home!” Awesome. Let’s scare people into going to your website. By the way, the dog ate sugar free gum with Xylitol in it, so be careful and keep an eye out for that. It’s harmful to dogs. I just want you to know because it’s important and useful information, no clickbait needed. There’s a twitter account I love called @savedyouaclick that’s directly fighting against this by doing the same thing I just did and spoiling the headline.